It’s no myth that the pop charts have become staid. We live in a musical climate where songs like Scream & Shout and Thrift Shop are currently riding high at the top of the charts; a climate saturated with endless dance tracks about drinking and shagging produced by robots; a climate where artists are more concerned with one hit single than creating a full album. Enter Tegan and Sara. These twins are unequivocally the best thing to come out of Canada and the best thing to happen to pop music in a long while. The girls have fourteen years of experience behind them, ‘Heartthrob’ being their seventh album since 1999. Their beginnings were rooted in angst-ridden pop-rock, reaching a pinnacle with the emo album ‘Sainthood’. For this new album, they are harking back to their youth but with a change of style to pure power pop, losing none of their angst in the process. ‘Heartthrob’ is concerned with falling both in and out of love - as Love They Say explains, “there’s nothing love can’t do”. The album’s title is directed less at a single figure and more at the passionate emotions that love can inspire, both positive and negative. Like the best pop songs, the lyrics are direct and simple, masking a wealth of earnest feeling – easily understood, easily relatable and highly emotive. 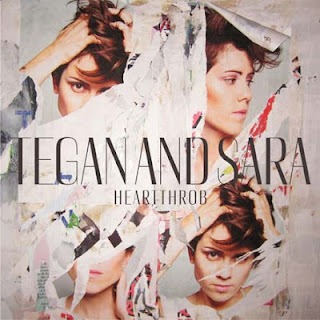 And with these love songs, Tegan and Sara have crafted a series of pop tracks that adhere to old-fashioned rules but, in this day and age, appear fresh. Sure, the girls have worked with some of the top pop producers of the moment (including Greg Kurstin and Rob Cavallo) and the production bubbles and fizzes with contemporary style. But ‘Heartthrob’ is tightly focused into ten three minute bundles, each one crammed with catchy hooks and sing-along choruses. This might be frothy pop, but a hell of a lot of care and love has gone into its creation. It’s youthful and vibrant, playful even, but there’s equally a maturity and a confidence here. ‘Heartthrob’ does work within a limited sonicscape, with its own definite style, but what’s so impressive is the album’s consistency. There is not one bad track, a feat that’s initially overwhelming. Keep listening and each track’s charms become more apparent. It’s almost impossible to choose a favourite from such an accomplished selection of songs. So keep your finger hovering over that repeat button – resistance is futile. * Every track. No really. Listen: 'Heartthrob' is released on 11th February. Listen to a preview at PopJustice.